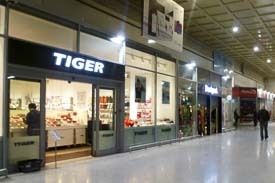 ABOVE: Santa Lucia Station now has a large selection of shops, with brands like L'Occitane and Tiger. You'll find more shopps and places to eat in the mall next door. "Does the station have food and shopping?" Food. Look for snack bars, a cafeteria, and other places to eat at both ends of the hall next to the train platforms. The building to your right as you exit the station (on the way to the Calatrava Bridge and the Piazzale Roma) also has a stylish pizzeria and bars. Shopping. Venezia Santa Lucia Station recently underwent a major renovation project that included the addition of shops like the ones you'd find in malls or airports. More shops, including a branch of the Japanese MUJI gift and accessories chain, are in the building to your right as you leave the station. For more information, see the station's Web site.